Evil Knievel may not be a name immediately familiar to younger readers but those of a certain age will certainly remember this American daredevil; he was the motorcyclist famous for leaping huge distances – one of his most famous jumps was the failed attempt to clear 13 London buses at Wembley Stadium in 1975, an act which almost led to his retirement. Now we have an online slot based on the great man. 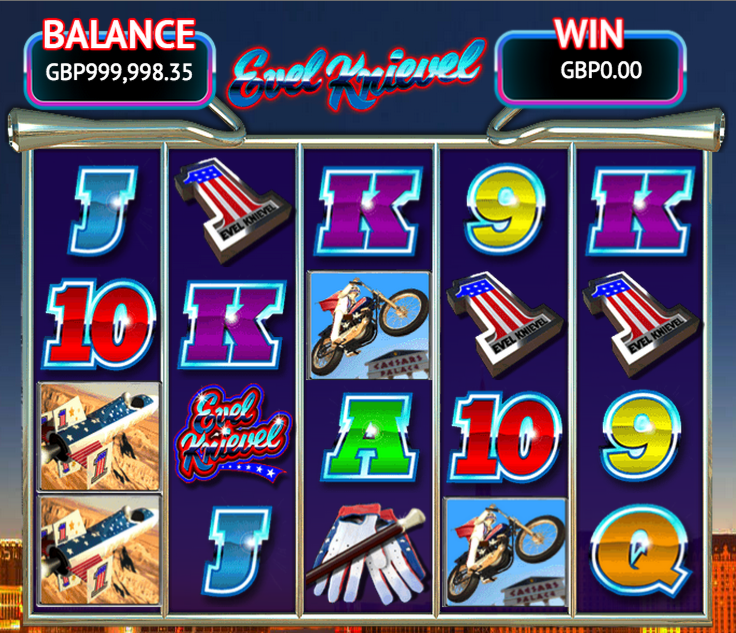 Evil Knievel is a five reel slot with four rows and fifty fixed paylines; the reels are set inside the chrome pipes of a motorbike and it’s all placed against a backdrop of Las Vegas. High value symbols include a US flag number one, Evil on a motorbike, his helmet and a pair of gloves and a rocket. The rocket can appear stacked on all reels and will pay out for just two in a combo (along with Evil and the number one). 9, 10, J, Q, K and A are the lower values. 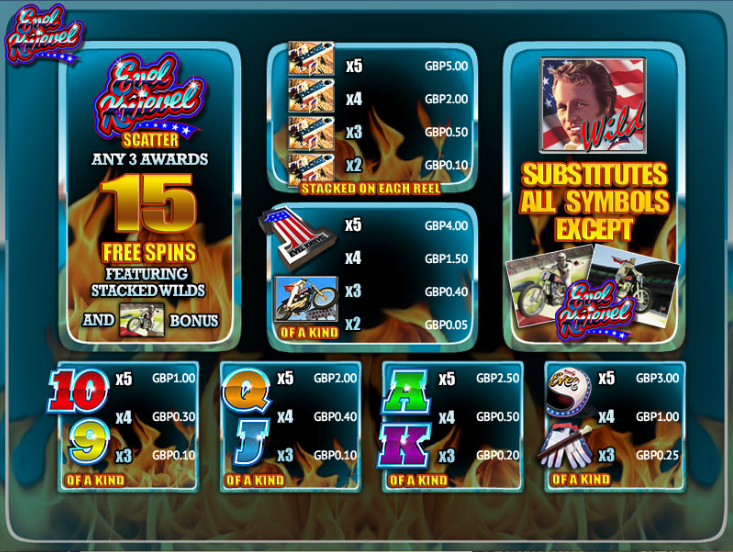 A close up of Mr Knievel is the wild symbol and the scatter icon is the game’s logo. This is triggered by landing three of the scatter symbol anywhere on reels one, two and three; you will now receive 15 free spins but as an added bonus the wild symbol can appear stacked on reels two, three, four and five. This can result in some big wins if luck is on your side. 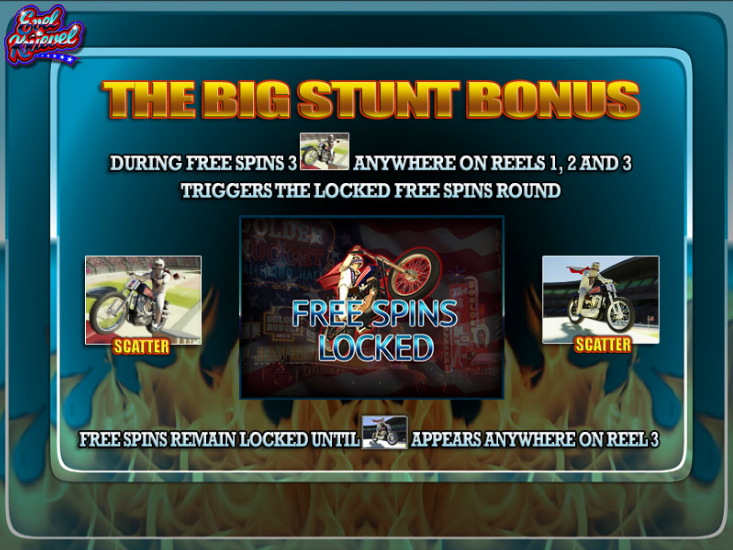 Two extra symbols appear during free spins – Evil riding to the left and to the right; if you can land three of the left facing ones on reels one, two and three you will trigger Locked Free Spins. Now the spins will continue without counting down until the right facing rider lands on reel five, at this point you revert to the standard free spins. Evil Knievel is perfectly playable if not spectacular so it’s definitely worth checking out, if only for the guitar music and sound effects. It can seem a little slow so if you prefer fast-spinning reels you may like to look elsewhere.